Why Do Mirrors Reverse Left and Right? When you see your reflection in a mirror, why does your right become its left, but top and bottom stay the same? I’ve seen this question answered a number of different ways, but the explanation that makes the most sense to me is also, I think, the simplest: mirrors don’t reverse left and right. They reverse front and back. Since “left” and “right” are subjective, let’s simplify the discussion a little: imagine that you’re facing due north and there’s a mirror in front of you. If you jump up, your reflection will also jump up–no reversal. If you step one foot sideways, to the east, your reflection will also step one foot to the east: not reversed. But if you step south, away from the mirror, your reflection will move north–the opposite direction. The reason mirrors seem to reverse left and right, but not up and down, is because when looking at our reflection we automatically imagine ourselves in their position–that is, turned around both left-right and front-back. This habit comes from a lifetime of interacting with other people and having to interpret their “right”, “left”, “front” and “back” in terms of our own. When we see our reflection, we reflexively identify it as another person, identical to us in every respect, except with all their features on the “other side”–e.g., a mole on the left side of your face is on the right side from your reflection’s “point of view”. But it is not the mirror that makes this transformation–it’s us, when we mentally turn ourselves around and put ourselves in our reflection’s shoes! 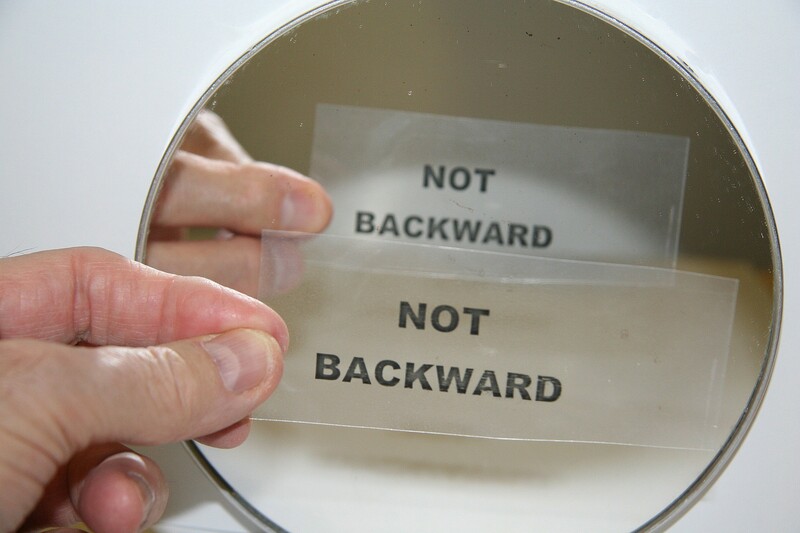 We are mentally reversing our front-back and left-right, but the mirror reverses only the first. Think about looking at yourself with a video camera. Here, left-right and front-back are both reversed (if you’re facing your recording, that is–if you’re looking at yourself from the back then nothing will be reversed). If you move towards the screen (e.g. north), your recording moves in the opposite direction (e.g. south); if you move to your right (e.g. east), your recording still moves in the opposite direction (e.g. west). The same goes for text printed on a shirt: in a recording, front-back and left-right are both switched, just like they would be on another person, so the text is legible; but in a reflection, only front and back are switched, so–just like a transparency sheet viewed from the wrong direction–the text appears “backwards”. To prove that the text on your shirt is not reversed left-to-right in a mirror, you could remove the shirt and point it at a bright light so that you can read it from the inside (in other words, the back–but with the right sleeve still on your right and the left sleeve still on your left). The text will look just like it does in the mirror: front and back reversed, but left and right the same. Feeling enlightened? Confused? Got a better explanation? Let me hear it in the comments! As a child, I once asked my parents how people knew what side of the road to drive on, to keep from crashing. When they told me “you drive on the right”, I was still confused–“whose right?” I thought. It took me a while to realize that it didn’t matter–if you’re traveling in the other direction, “right” is on the other side. This is not an intuitive idea. If the image I linked is confusing you, think about it this way: the text on the transparency is viewed from the front, so it is perfectly readable. The mirror “sees” the transparency from the back, so from its perspective the text is reversed front-to-back (just as it would be if you were looking at the other side of the transparency). But the mirror itself reverses front and back when it reflects the text back to you, so the reflection still appears legible because front and back have been reversed twice.